So I'm going to post something that's not a reader pick. I felt this was a big enough deal for me to move away from this month's pick-my-polish. I can't find any swatches of this polish online so I wanted to get it out there for anyone who may be interested in it. I swatched this last night after I did China Glaze Flying Dragon. For some reason, all my swatches from last night sucked bad. I did one other one that I will post tomorrow night. Please ignore all my mistakes. 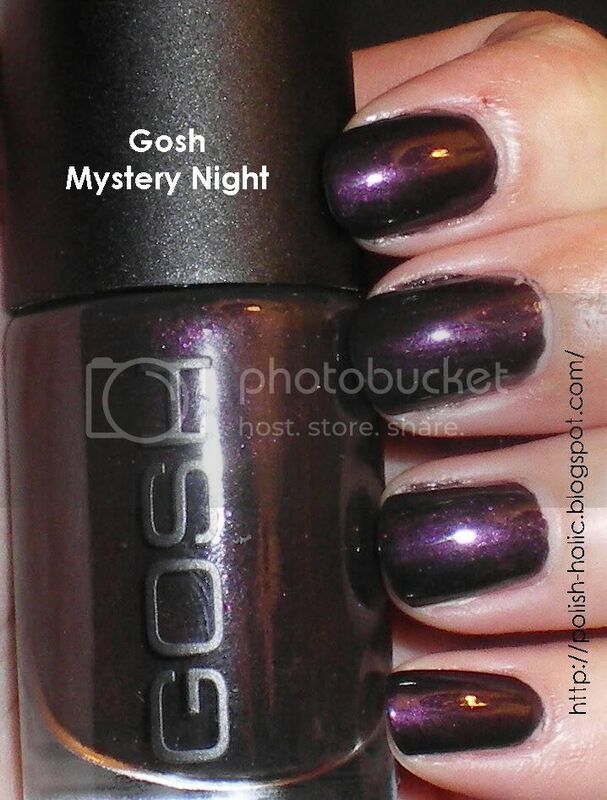 Mystery Night is from Gosh's Fall 2009 collection, "Sugar Babe" (click here for a picture and here for more information), and is a gorgeous deep eggplant purple. It's actually a black jelly polish packed to the brim with purple shimmer. I freaking love this. I saw it in the paper and I had to have it. So off I headed to my nearest Shoppers Drugmart. And I totally came home with five polishes. Then I went out again to find another polish in the collection and I came home with another two polishes. I will probably do swatches right away of polishes that I can't find pictures of online. This is two coats with top coat. It's streaky at one coat, but evens out and gets all nice and dark in two coats. I really love their short brushes, it allows for great control. The formula is also very smooth. There's just one thing they could improve about their polishes though, make them longer lasting. This polish chipped on the second day. Not badly mind you, just a little bit, but this is quicker than polishes like OPI or China Glaze. But this really doesn't matter to me as my polish is on and off in about two days anyway. I love dark colors, that's a good one. 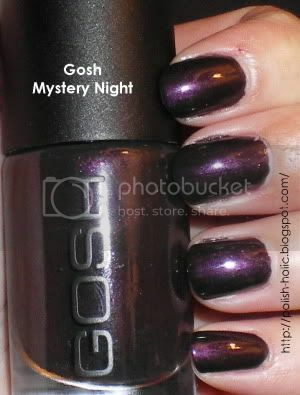 I'm wearing Gosh Ocean right now, it's a metallic green, really nice too. Hahaha, I totally grabbed that one too. I plan to swatch that one last as there are pictures already out there. It's really pretty. Ooo, that looks so pretty! I love how vampy it is! It is gorgeous! I've got Ocean, well somewhere, it was mainly what I wore all summer! gildedangel: Same here! I love vampies and neutrals. Well, and greens and light pinks... Hahaha. Small Town Gal: I got that too. I went bananas at the Gosh display. Lol.